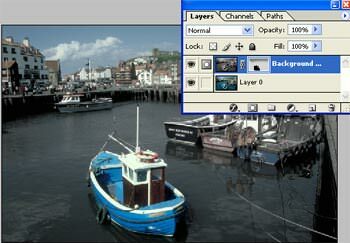 Peter Bargh explains how you can use the valuable Layer Mask option of Photoshop to make better colour changes and selections, in this step by step image editing technique. 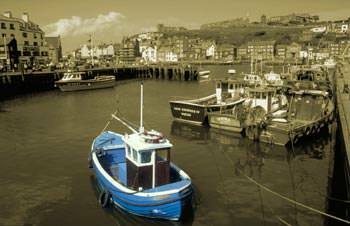 Last month I explained how to do selective colouring using the History Brush and here's how to do a similar job using the more controllable Layer mask. 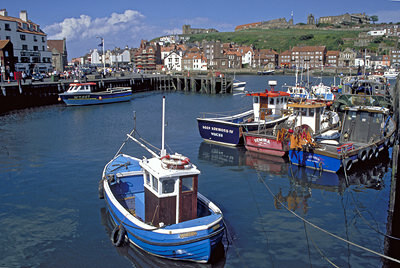 The photo, taken at Whitby, North Yorkshire, is ideal as the colourful boat in the foreground can be painted back into colour once the pictures is reduced to black & white. 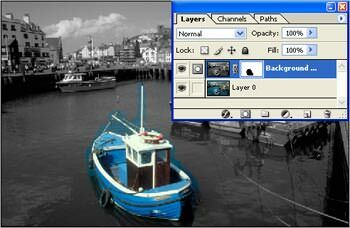 Double click on the thumbnail of your photo in the layer palette and click ok in the box that appears. Now duplicate the layer by dragging the thumbnail of the layer over the small icon that looks like a turning page at the bottom of the layer palette. Convert this layer to black & white by using the desaturate option; Image> Adjustments>Desaturate (shortcut Ctrl+Shift+U) This will make the image on screen look black & white, but notice that Layer 0 is still in colour. Then create a layer mask. Layers>Add layer mask and choose reveal all. This creates a small white box next to the duplicated layer thumbnail. Image the white mask you have added is like a sheet of glass covered with white paint that has been combined with the black & white picture. You can now use the erase tool to remove the paint and reveal the colour from the layer below. Any areas you remove will appear black on the small thumbnail, as you can see here. If you make a mistake or want to remask you just paint back on with the brush. Be sure to make sure background colour in tools is set to black for painting in colour & background switched to white to correct mistakes. For speed I painted all over the boat using a large brush which is fine for the centre area but doesn't allow accurate colouring of the smaller edge details. So once you've done this magnify the image using the zoom tool and select a smaller brush size to paint back the mask as illustrated here. When this is all done you will have a colourful subject framed within a black & white scene. There are several advantages to using the mask technique. which I'll cover briefly below. And, in this example, I went to the brush title bar options to reduce the opacity of the erasor brush to 70% and painted across the skyline and then to 40% and painted over the rest of the picture. 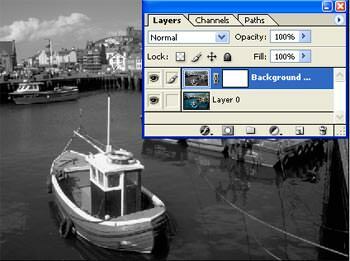 By varying opacity you vary the amount of background colour the mask lets through so the sky is less colourful than the boat, but more than the harbour. 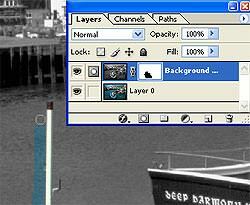 Notice the mask thumbnail now has a black blob where the boat is, a light grey wash where the harbour water is and a darker grey strip where the skyline is. Another benefit of creating a mask is that you can turn the mask into a selection which will appear around the mask so you can then cut out the object and paste it into a different background. If you save the photo as a PSDand don't flatten the layers this can be done in the future and further corrections can be made to the mask if required. To create a selection from the mask go to Select>Load selection. Here's a fun idea using the masked and selected boat. I copied and pasted it into a scenic waterfall. 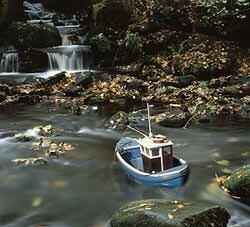 Resized so it looked like a toy boat and added a faint reflection so it looks more natural in the water. 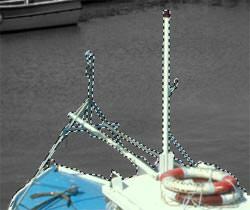 I also took advantage of Photoshop CS's new Color Match mode to make the boat look a similar colour match to its surrounds.